From the Hancock County Courthouse, to 7.5 miles on Hwy 22 east to Springfield Church Road. Turn left onto Springfield Church Road. Go 3.4 miles to Springfield Church on the right. To the left of the church is a dirt drive. 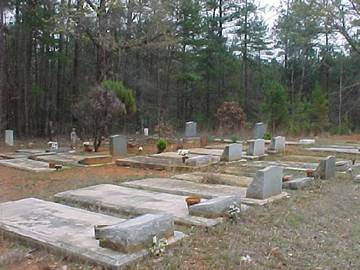 The cemetery is 0.2 mile up the drive in the woods. New grave (summer, 2002) with no marker. "Death is another life" Adult-sized slab. Adult-sized slab with "Sellers" gravestone. "A loving wife at rest"
d/o Joe and Emma Walker. s/o Edward and Maryzena Wilson. h/o Maryzena McGhee Wilson. Children: Eddie Jr., Mary Alice, Eliza, Walter, Patricia. Georgia AT COC 370 Inf 93 Div. "Loving Wife and Mother" No death date as of summer, 2002. "Loving Wife, Sister and Aunt"
No death date as of summer 2002. On same headstone as Carolyn J. Mays. On same headstone as Clarence Mays. "Love, Daughters - Lucille, Recsla, Bessie and Lizzie"
All info per funeral marker. New grave as of summer 2002. "In memory of a loving husband and father"
Funeral home marker is unreadable. 3 graves, one with an older slab. Last name and dates difficult to read. Dixon Funeral Home marker not readable. 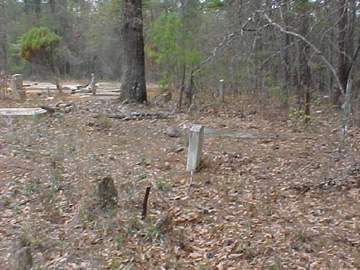 3 graves at the end of the woods. Raymond C. "Preacher Man" McGhee, Sr.
of Jamaica, N.Y. per obituary. Age 71. of Atlanta per obituary. Otis C. "Preacher Man" Swain, Jr.